NIMD > News > Is politics more than just a game? Is politics more than just a game? Welcome to Democratia, a middle-sized tropical island somewhere in the Pacific. For a long time the country was occupied by a foreign power, but it has recently become an independent state. During the occupation different groups emerged, each with its own background stories and political interests. Democratia has been granted 2 years by the international community to establish a multiparty democracy with stable institutions that respect the rule of law. 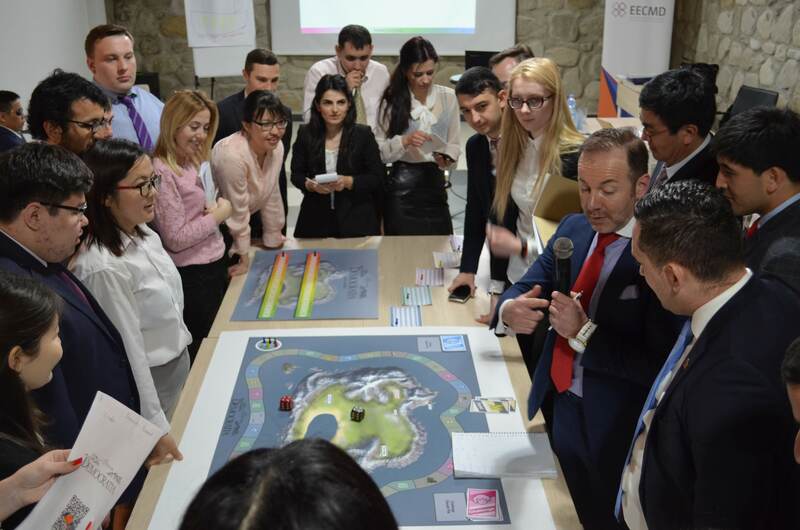 This was the challenge given to 23 Democracy School students from Kyrgyzstan, Moldova, Ukraine, and Georgia at the launch of Democratia, NIMD’s political board game: to work together and start a multiparty system from scratch. Working in teams, players are challenged to ensure their party can get its core policies through a coalition government. Using the skills gained after a week of training in political ideologies, democratic institutions, and dialogue techniques, players worked in teams to ensure their party’s views were included in Democratia’s first grand coalition. From fixing radiation leaks to handling villages in revolt, the teams had to govern based on their party’s values, while forging the consensus that will build a stable government. 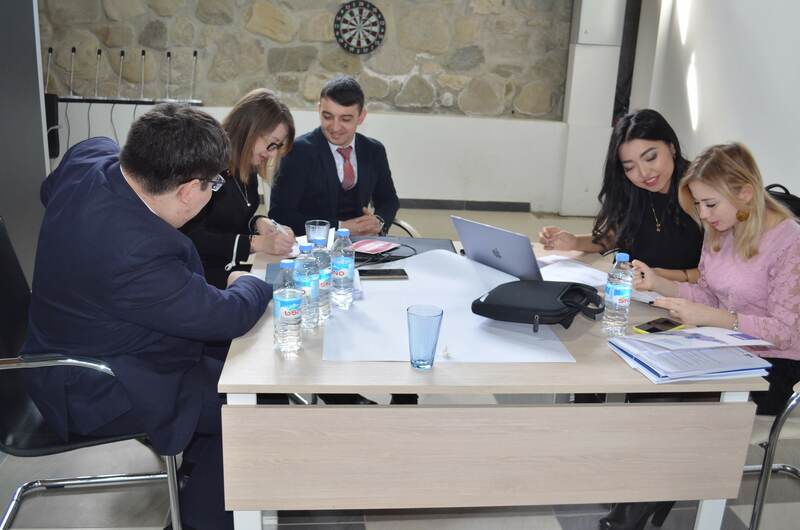 Democratia is in fact a highly effective tool for showing Democracy School students how parties can operate together effectively in a multiparty setting. Just like in real elections, parties have to balance their core values, main voter groups, and political rivals. At the same time, they need to retain their position in government and handle day-to-day policymaking. When put together, Democratia players have to think on their feet, avoid political squabbling, and sometimes count on a lucky roll of the dice. The reality of learning about working in a democracy is that it’s about building practical skills. Sometimes lectures, books, and discussions won’t work; you need to put yourself in the shoes of politicians and see how you can handle different situations. 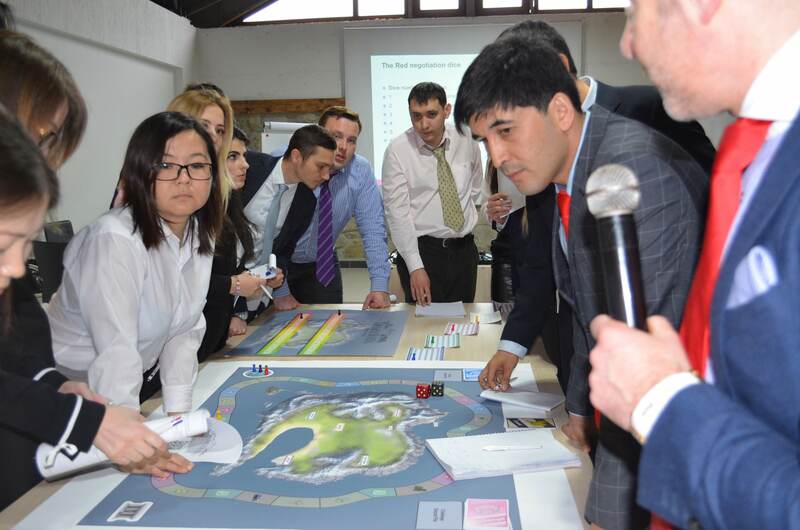 From handling an oil shock to securing international aid, the teams had to negotiate with other parties while facing multiple real-world issues. Following its official launch in Georgia this week, we look forward to bringing the Democratia challenge to our other Democracy Schools around the world. Scroll down to see more of the game in action!